Most days, I write about hockey on this platform but some things are bigger than hockey. Today is #BellLetsTalk day to help raise awareness about the importance of mental health and help to erase the stigmas that surround it. Days like today are just the beginning and we need to continue the conversation to break the silence every day, not just today. Let’s talk for those who have fought and lost the battle reminding us how important it is to fight this battle every day. Let’s talk for those who continue to battle the same battle every single day. Our mental health is as important as our physical health. 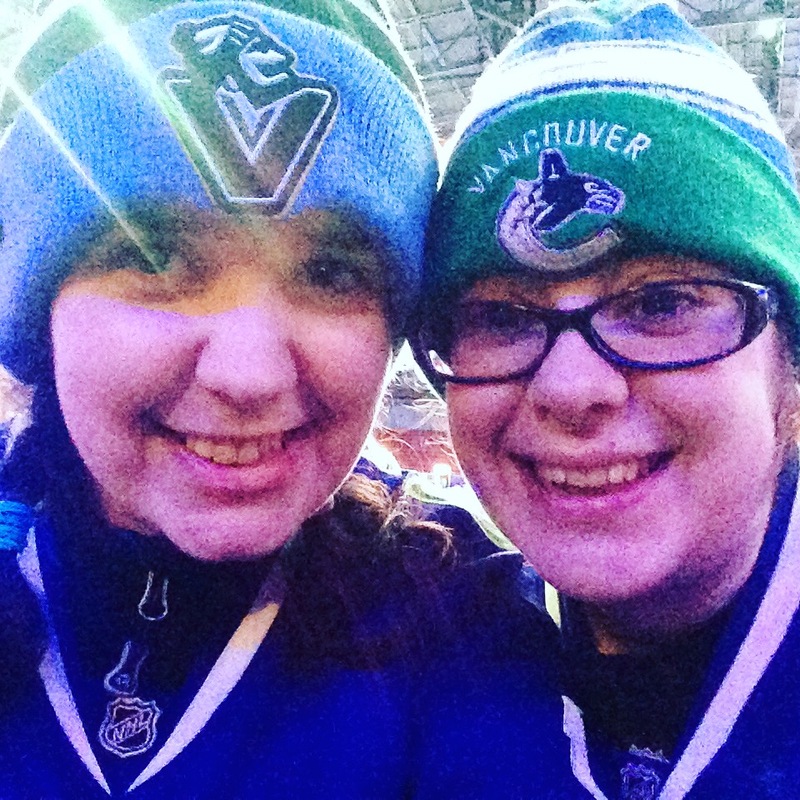 As a Vancouver Canucks fan, a hockey fan, as a friend, and as myself, I have witnessed all ends of the spectrum of how important an individual’s mental health is to their overall health. And let’s face it, it is a conversation that we should be having EVERY single day. It’s okay to not be okay. It’s okay to ask for help or admit that you need help. There is absolutely NO shame in any of it. Your mental health matters today, tomorrow and always. Let’s keep breaking the silence so that NO ONE has to suffer alone or ever fear speaking up. Just because someone smiles does not mean they don’t have problems, sometimes it is those who smile the brightest who suffer the most. Sometimes it is affecting people next to us and we cannot see it. Sometimes it happens to not just someone you admire or your friend, it happens to you when you never saw it coming. Sometimes it comes at you in waves and sometimes it comes all at once. Some days you will feel consumed and as though you cannot possibly make it to tomorrow, but you battle through it. It may not feel better today or tomorrow, but it DOES get better. Sometimes all you need is one person to listen, one person who will not judge you. Talking about it helps. Having a support system helps. And if any of you ever need someone to talk to, or simply to listen, know that you can talk to me free of judgement at any time (leave me a comment below, send me a tweet [@nucksaid] or even an email [nucksaid@gmail.com]). Let’s get loud about our mental health so much so that it becomes a part of our every day routine and the stigmas no longer exist. They said it was impossible. They said he didn’t have what it takes to make it long term in the NHL. They have spent years berating him and his brother for everything they do on and off the ice. They have no idea just how valuable these two players have been to the Vancouver Canucks organization, fans and the city of Vancouver. Henrik Sedin deserves all kinds of respect in the hockey world despite arguments from those on the outside will say. They can keep telling us all the insults, there is not one negative thing that Canucks fans haven’t heard over the years. They will keep proving why they ARE deserving of being inducted into the hall of fame one day down the road. From a rookie searching for his game to a now seasoned veteran leading the way on and off the ice. Friday night was all kinds of incredible for Canucks fans to witness as Henrik Sedin had another night for the record books. All week you could feel the energy building up in Vancouver as Henrik edge ever closer to the milestone. Walking into Rogers Arena for the game against the Florida Panthers, you could feel the anticipation in the air. There was a buzz among fans as we were ready to witness Henrik Sedin reach yet another milestone. His very first NHL point came against the Florida Panthers, so it seems fitting that his 1000th should come against them as well. The feeling in the arena was electric from start to finish. It is a game that my sister and I will remember every second of the experience for years to come. 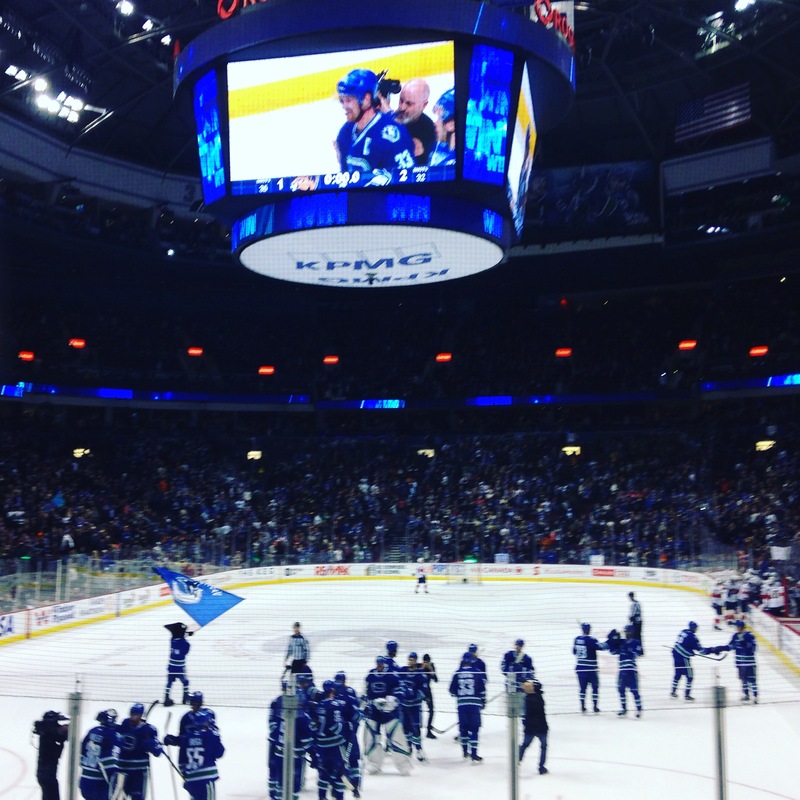 Sometimes hockey is pure magic and if you’re really lucky you will get to witness it just as an incredible crowd did Friday night when Henrik Sedin scored his 1000th NHL point. Heading into the game, every single person in attendance knew the possibility of what we might witness and was hoping it would be more than an assist or an empty net goal, and boy did Henrik ever choose the perfect moment to deliver his 1000th point in style with a goal versus former teammate Roberto Luongo. Down 1-0 in the second period, cue the Sedinery play taking over and pulling 18,000 fans to their feet. Edler to Daniel to Henrik putting the puck past Luongo. Pandemonium ensued as cheers rained down as the arena made their appreciation heard loud and proud. You could not have scripted the moment ANY better (unless perhaps somehow Burrows had been on the ice). Even more heartwarming than seeing that goal right in front of our seats was seeing not just the entire team rush to the ice to take in the moment, but also the props given to Henrik from Roberto Luongo. Welcome to 1000 points club, HANK! Henrik wanted the point and to reach what once seemed like an impossible feat but more than that he wanted two points for his team. Isn’t that just like Henrik, that rather than be consumed by his own milestone, he put his team first? Sounds familiar doesn’t it? The Sedins while deserving of immense respect do not go out looking for recognition, they simply go out setting an example of what giving their best looks like every shift. Once again Henrik reached this latest milestone with his brother not too far behind him in the hunt for the very same feat. Daniel Sedin with an assist is now just 32 points away from joining his brother in the 1000 points club. Will we see another Sedin milestone this season or maybe early next season? One thing is certain, whether it occurs this year or next season, Canucks fans are incredibly lucky to get to witness both milestones. The day will come when the Sedins retire, but until that day comes, take in every moment of Sedinery that happens. Thank-you, Henrik and Daniel for 17 years and counting of incredible moments that will live long in the history of the Vancouver Canucks. Don’t look now but the Vancouver Canucks have gone streaking! The team is currently on a 6-game winning streak. Yes, it’s not the recent crazy incredible 16-game win streak like the Columbus Blue Jackets just had, but it’s still been nice to see the team come together cohesively over this latest stretch that has seen them post a 8-2-1 record over the last 11 games. During that 11-game stretch, it has been the surprising trio of Sven Baertschi, Bo Horvat and Alex Burrows leading the way offensively with a combined 25 points. Ryan Miller has quietly been stepping up his game despite his critics. He’s posted 5 straight victories, stopping 150 of 157 shots and posting 1 shutout over those 5 games. Not be left out, Jacob Markstrom has also upped his game of late heading into tonight’s game vs. Calgary. This is their first 6-game win streak since posting a 7-game win streak in December 2013 under John Tortorella. Oh the irony! And yes, tonight they will go for their 7th straight victory and a chance to get back into a wildcard position in the Western Conference. When the team was losing, the media and fans critiqued them for not being able to finish games and suggested that they should commit to tanking. Now that they have put together a solid 11-game stretch and 6-game win streak, the media has been complaining that the team is still not doing enough. And yes, you might tell me that a 6-game win streak is nothing to get too excited about or that perhaps over this stretch the team has not played their best hockey. You might tell me to get ready for the streak to end. Guess what? A win streak is a win streak and I intend to enjoy it in it’s entirety no matter how long it lasts. I’ll take the wins any way that they come and I will savour every single one. And yes the streak will inevitably end as they all eventually do but that won’t stop me from supporting my team all the way. Heading into the season, I was told that I should have zero expectations for the Vancouver Canucks. I was also told that there was likely to be any reason to be excited about this team and I should try rooting for a different team. And you know if you’ve followed my blog or social media accounts that I do not rely on the odds or the so called “expectations”. The more someone tells me not to support my team, the stronger my support for them becomes.